Costcutter store in Deptford, London. Costcutter is a UK-based business primarily operating as a symbol group supplier to various independently owned convenience stores and off-licenses. It has operations in the United Kingdom, Ireland, Poland and Jersey, Channel Islands, encompassing both supermarkets and convenience stores. 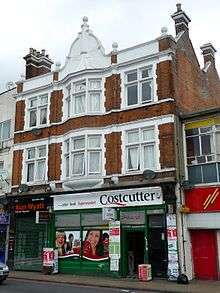 As of December 2006, Costcutter (Ireland) was owned by James A. Barry and Co.
Costcutter was founded in 1986 by Colin Graves. As of November 2006, there were some 1,400 stores under the banner. In May 2006, the majority of stores were in the United Kingdom, with 65 stores in Ireland and 52 in Poland. Many locations in the UK were formerly SPAR locations whose owners switched to Costcutter because of cheaper fees. SPAR is still a major competitor and has 2,535 stores in the UK, 422 stores in Ireland, 50 stores in Poland and 13,686 overall locations worldwide in 32 countries including locations as far afield as Australia, South Africa, Morocco, Japan and China. A proposed merger with Nisa-Today's collapsed in 2006 after concerns about a cartel. which were reported to the UK Office of Fair Trading by members of Nisa-Today's who opposed the merger. These claims were eventually proved to be unfounded and no action was taken by the OFT. Up until April 2011, Bibby Distribution was the logistical provider for Nisa-Today's and therefore also Costcutter. From April 2011, the contract was won by DHL who now deliver to Costcutter and Nisa stores using a new fleet of NISA branded lorries. In 2014, Costcutter opened 18 stores in Jersey, Channel Islands, taking over all outlets which were owned by SPAR. ↑ "About Us!". Costcutter. 28 March 2016. Retrieved 28 March 2016. ↑ "What is Costcutter?". Retrieved 17 November 2012.